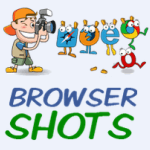 What is Browsershots? Browsershots is a webmaster tool that webmasters use to make over 200 screen shots in different web browsers of one of their web pages. Why would you want to do this? Because your site looks fine with the browser you use does not mean that its going to look the same on all browsers. Visitor uses different browsers than the browser that you use. Your site design could be all over the place, with text overlapping on images, or your sites to wide and lots more. With Browsershots you get lots of screenshots of the web page you are testing but its screenshots of how your site looks like on that browser, below the screenshot is the name of the browser. Below is our home page displaying a few of the screenshots on different web browsers from browsershots. If you are going to create a website then part of the process is to have a great looking design but how do you know what your design will look like on other computers that use different web browsers? One of the best ways that is fast, free and easy to use is to visit Browsershots and test your page on a large selection of different website browsers and be sure. They have software on their site that will check browser compatibility on hundreds of different web browsers with a click of a button. You will get over 200 screenshots of the web page page you submitted. All you have to do is sit back and when Browsershots has finished loading have a look at the screenshots of your site in different browsers. If you find that your design has a problem in one of the browsers you will know that you have a problem with your coding and you will have to fix it, once fixed use Browsershots again and see if its fixed correctly. Browsershots is a free open-source online web application providing developers a convenient way to check browser compatibility in one place. When you submit the page you want checked, it gets added to the job queue. A number of distributed computers will open your web page in their browser. They then will make screenshots of the page and upload them to Browsershots dedicated servers for your review. If your site has a problem you will see it in the screenshot. Any problems on any of the screenshots could mean that you have a coding problem, and you might want to think about finding the problem and fixing it. 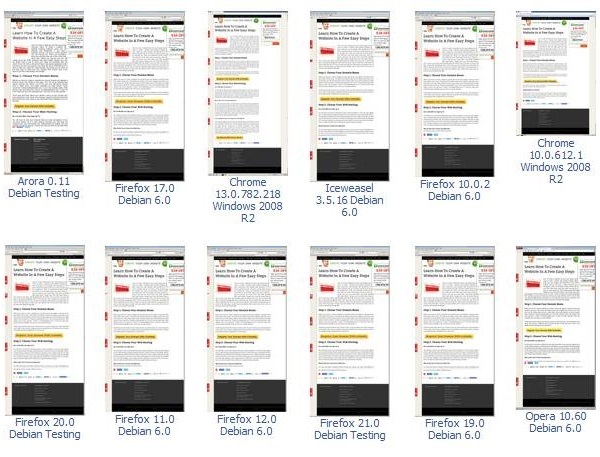 Check your sites design do a browser test with Browsershots.